Are you an aspiring florist or interior designer? 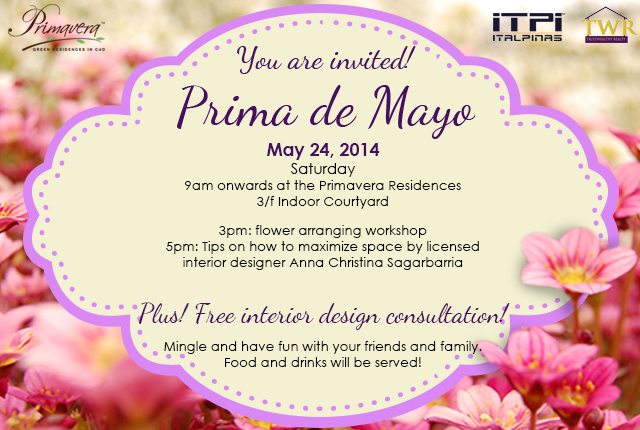 Learn the art of flower arrangement and interior design at Primavera Residences on May 24. The premier residential and business condo complex in Cagayan de Oro is hosting the Prima de Mayo Workshop, a whole-day event conducted by licensed interior designer Anna Christina Sagarbarria, at its green inner courtyard. Anna Christina Sagarbarria has designed condominium spaces, townhouses, and apartments in Cagayan de Oro as well as in Makati and Taguig. She specializes in renovations and home-makeovers but also designs for retail and commercial spaces. She studied Floral Artistry under the tutelage of interior designer Leo Almeria and floral designer Rachy Cuna. Prima de Mayo will start at 9AM and is open to the public. It will feature a number of fun activities ideal for friends and families. The flower arrangement workshop will start at 3PM followed by Sagarbarria’s talk on interior design at 5PM. She will share smart and innovative tips on how to maximize small spaces. She will also provide free consultation on interior design during the event. The Prima de Mayo workshop is organized in partnership with Truly Wealthy Realty Corporation, one of Cagayan de Oro’s property brokers and Primavera Residences’ top performing realty broker in 2013. Primavera Residences is an internationally-recognized mixed-use green property in CdO. It is a 10-storey, twin-tower condo building with eco-friendly features including an indoor courtyard that enhances natural airflow within the building and a facade fitted with ledges that provide shade against the harsh sunlight during the hottest part of the day. It has received several recognitions from international award-giving bodies for its green architecture and energy-saving features. Recently it won in the prestigious 2014 Asia Pacific Property Awards in the Mixed-Use Development category. Primavera Residences was also awarded by the Southeast Asia Property Awards (SEAPA) for Best Condo Development in the Philippines in 2011. For any inquiries about the workshop and Primavera Residences, call (088) 310-8173, 0917-7921078 or send us a message here.